It's rare to see a protein powder that is manufactured by the same company that markets it. APS Isomorph 28 breaks this trend. APS manufactures Isomorph 28 Protein in their GMP facility, controlling all aspects of the manufacturing process from start to finish. Isomorph 28 is more than just another isolate protein, it's 4 ultra-pure whey protein isolate, including hydrolyzed whey protein isolate; guaranteeing its purity and freshness. APS Isomorph 28 Protein contains extremely small protein molecules that are literally 18x smaller than the proteins from almost every other product on the market (1000 Daltons vs 18,000 Daltons). This means that they can be completely absorbed because the intestinal wall allows them to pass through thanks to their small size. Since these small proteins get into your bloodstream via the small intestine, they get to work right away and require minimal effort from your digestive system. APS Isomorph 28 Protein provides the highest quality whey isolate protein available with a higher amino acid profile, gram for gram, than ordinary whey protein. Protein is for everyone! Whether you’re a bodybuilder, athlete, business professional, or student, protein is an essential component of overall health!APS Isomorph 28 Protein gives you a quick and economical way to increase your daily protein intake. Each serving contains a complete array of whey protein fractions, is high in the essential amino acids, and rich in glutamine peptides, giving you the right tools for muscle growth and preservation. APS Isomorph 28 Protein contains only the purest, highest quality whey protein isolate to help you reach your health and fitness goals. Whey protein isolate is 90% protein by weight, making it low in carbs, low in fat and virtually lactose free-and it delivers a whopping 28 grams of protein per scoop. It is cold processed, micro & ultra-filtered, and un-denatured to produce the most wholesome form of whey protein available. Low in carbs, Low in Fat. APS Isomorph 28 Protein is extremely low in carbs and only has .5 grams of fat per serving. APS Isomorph 28 Protein is perfect for dieters. It absorbs quickly to maximize muscle growth and repair without the heavy feeling associated with fat and carb rich meals. IAPS Isomorph 28 Protein is quadruple-processed using ultra & micro filtration, ion exchange and hydrolysis. This ensures an isolated whey protein that contains at least 90% protein with minimal lactose and fat. These isolation processes separate the valuable protein from non-protein materials, yielding a highly purified whey isolate. What's In APS Nutrition Isomorph 28? Take 1-4 servings of APS Isomorph 28 Protein a day to encourage a positive nitrogen balance. Consume approximately 1 gram of protein per pound of body weight per day from a combination of high protein foods and supplements. 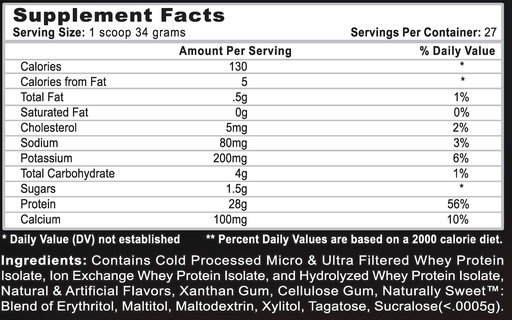 Add 1 level scoop of APS Isomorph 28 Protein to 8-10 ounces of milk, water, juice or your favorite beverage. APS Isomorph 28 Protein mixes instantly with just a spoon. As with any supplement, check with your physician prior to use. Do not use this product if you have any current or previous medical condition of any kind. Such conditions may include but are not limited to high or low blood pressure, stroke, arrhythmias or palpitations. Any heart, thyroid, or liver condition. Seizures, anxiety or depression, prostate enlargement or inflammation. Do not use if you are nursing or pregnant. Do not use if you are taking an MAOI. If any adverse symptoms occur discontinue use immediately and consult a physician. Keep out of reach of children. DO NOT take for more than 8-10 weeks without an 8-10 week off period. Before beginning any program of weight loss, consult your health care practitioner. These statements have not been evaluated by the FDA. This product is not intended to diagnose, treat, cure or prevent any disease. We have a large selection of in-stock APS Nutrition products including Whey Isolate Protein items and others for the lowest prices at SameDaySupplements.com® It's always easy to shop for Isomorph 28 Protein By APS Nutrition at SameDaySupplements.com® because you can browse by reviews, brand, prices or search for specific ingredients using our search tool. In-stock orders placed before 3pm EST ship out the same day to USA, Brazil, United Kingdom, Canada, Germany, Australia, Japan, India, France and worldwide at the cheapest prices online.